Visitor Submission and Question: I've been wondering about how our large suburban neighborhood adjacent to a major city could maximize a major donation we just received for a public fountain. A couple of friends and I have been collecting photos of both classical and modern fountains that we like and then trying to analyze why some are more pleasing than others. It seems that the ones that are the most memorable are those that flow from a skillful sculpture or highly original idea. We are beginning to think that the background is more important than the water, which always will be beautiful. Since we can only send four photos, I picked some to illustrate this point. 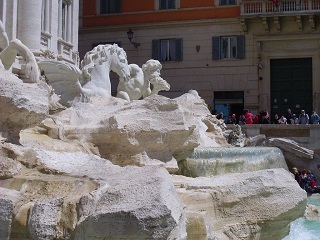 First, we see the famous Trevi Fountain in Rome, where the outsized sculpture and the very large pool are much more prominent than the actual falling water. 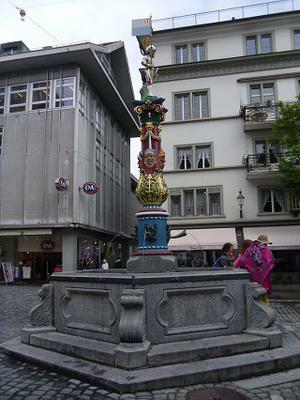 Next is a colorful piece in Luzern, Switzerland, where the sculpture is the main event and the water spouting out a few places seems like just a whimsical after thought. 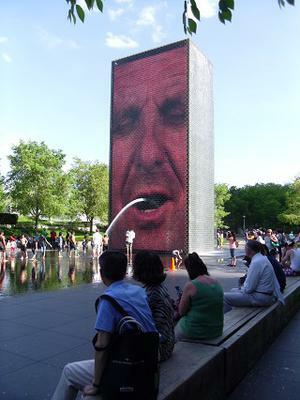 The third photo is of the Millennium Park Crown Fountain in Chicago, where the video wall of faces definitely makes us remember it, far more than the water spouting out of the mouth. 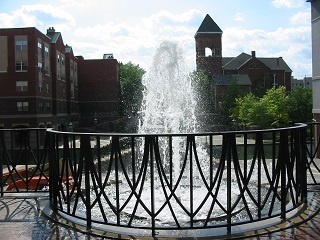 Last I chose a photo of a fountain along what I think was called the Canal Walk near downtown Indianapolis. It is really pretty, as is the iron railing around it, but neither the water nor the railing is something my wife and I remembered from our travels until we saw this photo. My friends and I would like to know if you and your readers agree with our conclusion thus far that the sculpture part or the backdrop of the fountain is very important in making an impact on the visitor. Editors Reply: Thanks for taking time to send and describe the photos. Yes, we think it's true that the sculpture or backdrop for the fountain is what really makes it stand out in our minds, unless the quantity of the water is just spectacular. We're thinking of the fountains at Bellagio in Las Vegas, which periodically shoot huge quantities of water skyward. We would advise you also to think very carefully about the scale and dimensions of the fountain. For example, does it need to be quite tall, maybe because buildings or trees around it are tall and you want your fountain not to be dwarfed. Or maybe you really need to fill quite a bit of horizontal space because your plaza or other site is quite wide and you want the fountain to be the dominant or only site amenity there. If you find that the appropriate scale is compromising affordability of the fountain, there are just a few tricks you can use. If you need more height, perhaps a talented landscape architect can design a fairly tall berm that would be suitable below the base of the fountain. If you need more width, try expanding the fountain area visually by adding some colorful planting beds. If color will distract too much, then the alternative would be a monochromatic gardening bed, perhaps only an interesting variety of evergreen shrubs or maybe a low shrub with white flowers much of the year. Another wide to widen out the fountain feature visually is to design a wide pool at the base of the fountain. Take a cue from the Trevi Fountain. So yes, we do agree that a strong sculpture is the key to a memorable fountain that provides an identity to your plaza or even your town, as opposed to one that is merely pretty. We love pretty fountains, which have the additional effect of making it seem cooler on a hot day, but as your Indianapolis example does illustrate nicely, pretty doesn't mean I'll remember it tomorrow. We would love to hear from readers on this subject too.